1) Cut 8 inches of Beadalon Wire. 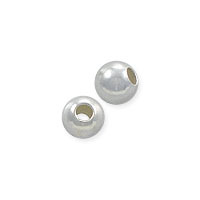 2) String 1 silver bead. 3) Attach your Closed Jump ring to the short end of your wire, and bring approx. 1/2 inch of the wire back through the silver bead. 4) String 1 crimp bead next to the silver bead and crimp the bead using your crimping pliers. 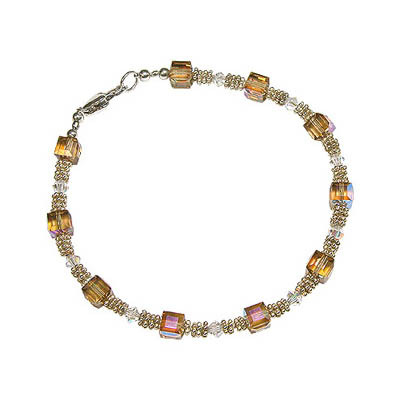 Repeat bead work until you have 10 sections, or just enough so the bracelet wraps around your wrist with little lag. 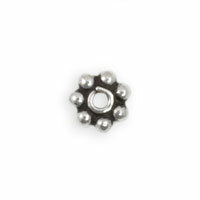 6) String 1 silver bead, 1 crimp bead, another silver bead and 1 open jump ring for your clasp. 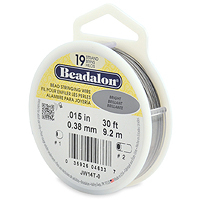 7) Bring the remainder of your Beadalon wire back through the few bead beads of your beadwork. 8) Crimp the crimp bead and cut off excess Beadalon wire. 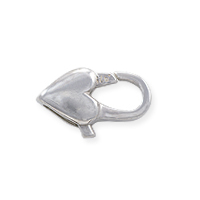 9) Attach clasp to your bracelet.